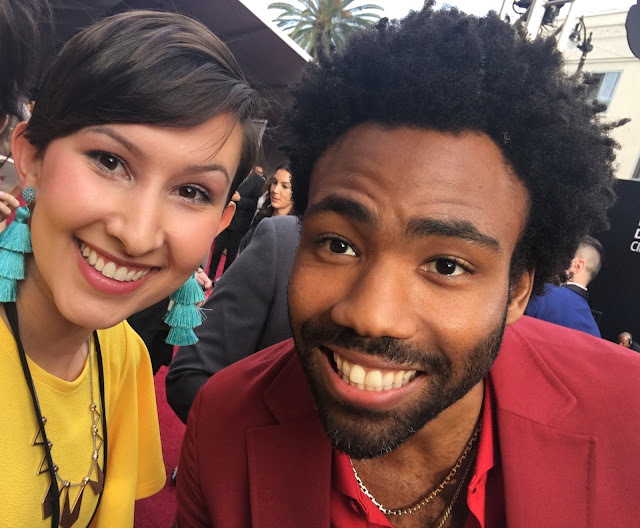 Last night I had the opportunity of a lifetime to attend the world premiere of SOLO: A Star Wars Story. As soon as I got the invite last week, I immediately booked my flight and started screeching. I still can't believe it happened. In regards to the movie, I'll say that I LOVED it, but I will leave it at that for now. As the official release day gets closer, I will probably do a spoiler-free review, but today I just want to share my experience at the red carpet premiere, best moments of the night, and my outfit. Without a doubt, the best part of the premiere was the fact that I got to share the night with so many amazing women. My friends Danielle, Sloane, McKenna, Katie, Rianne, Charlotte, Caitlin, and Esther were all there. Talk about squad goals! 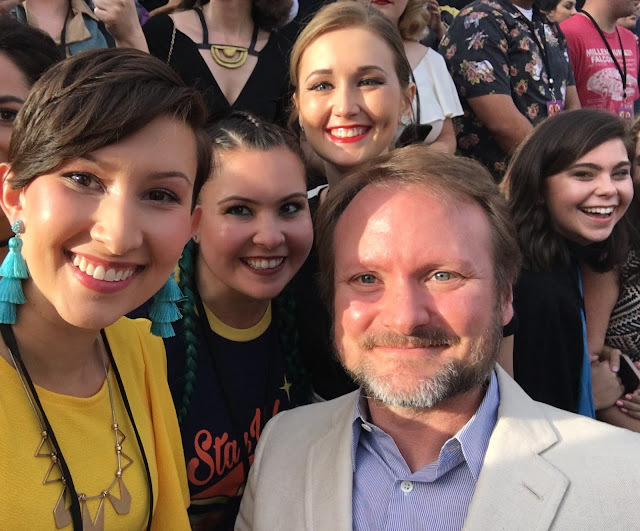 All of these girls are some of the kindest, most encouraging fangirls I've ever met so I was super thrilled to hear they were attending the premiere as well. After checking in at the El Capitan and getting our badges for the night, we were ushered to the red carpet area where the Star Wars Show was starting their live stream of the event. Stars were coming down the red carpet to say hi to all the fans and get interviewed for the live stream. Our group got super lucky because we were staged right in front of the stairs where the stars had to walk up to the Star Wars Show stage. I asked a ton of the actors, actresses, and producers for selfies to remember the night and amazingly none of them turned down a photo request! 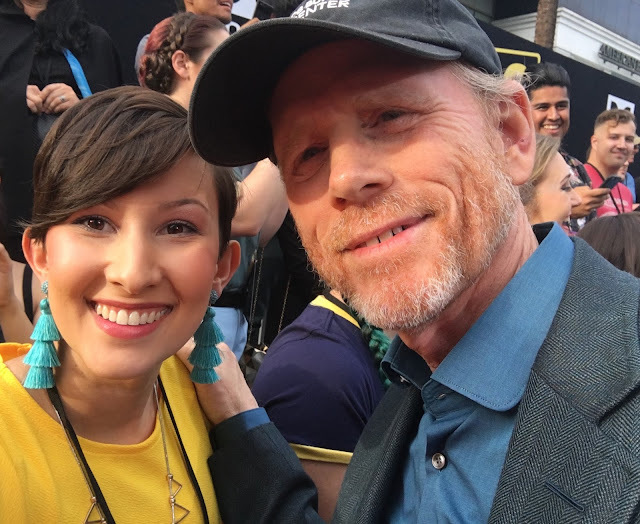 Ron Howard was so humble and kind to all of the people wanting to meet him. All of the fans pretty much lost it when George Lucas showed up at the red carpet and while I didn't get to personally meet him, it was amazing just to see him interact with the new caretakers of his precious creation. I took a TON of photos last night, so here are my favorite selfie shots! And for my last celeb photo, this one is truly special. One of my biggest dreams since I became a Star Wars fan has been to meet Kathleen Kennedy, the president of Lucasfilm. Kathy has an amazing life story about how she was an assistant to Steven Spielberg and eventually impressed him enough to become a producer. Now she calls all the shots for Lucasfilm after George Lucas sold the company and I admire her so much. Kathy was walking up to the Star Wars Show stage for an interview and when she was leaving the stage, she was kind enough to stop for one photo and it just happened to be with me. Needless to say, after our quick photo I broke down into tears because my dream finally came true. What an icon! 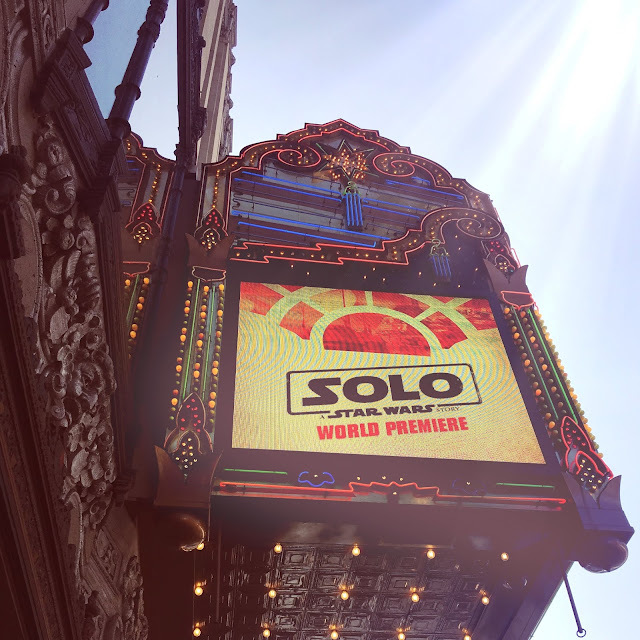 When the red carpet fun was over, we were taken to the Chinese Theater to be some of the first people to see Solo: A Star Wars Story. The theater was gorgeous and the movie was great. I'll share more on that after May 25th! After spending an unexpected chunk of change on a flight to LA and back, I didn't want to go too overboard with spending a ton of money on my outfit. I looked in my closet and didn't find anything that I felt was red carpet worthy or even remotely appropriate for the event. I finally decided that I wanted to buy a mustard or bright yellow colored dress. I scoured the internet for a dress that I had in mind, but everything that I came across was $80 and higher. I knew I could do better! 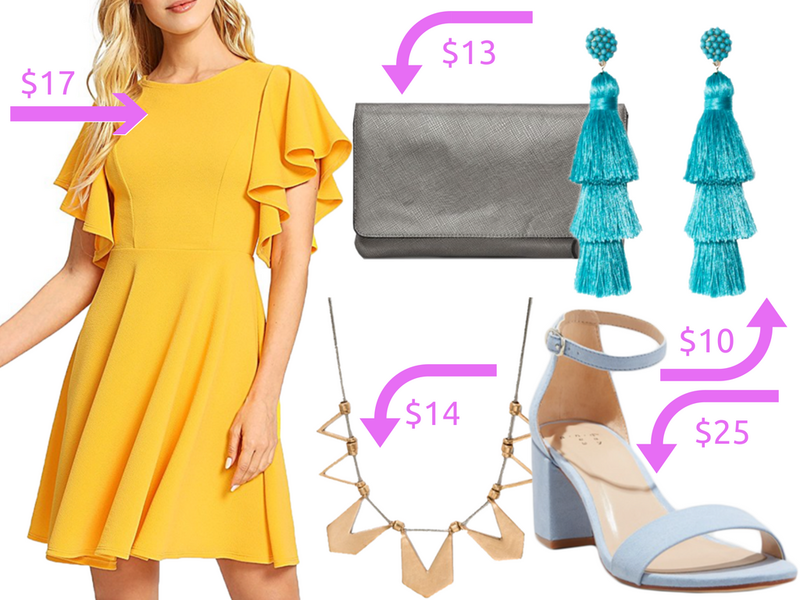 Finally I found an adorable Yellow Party Dress on Amazon that was eligible for 2-day shipping (perfect in case it didn't fit and I needed to hit the mall for a better solution). The best part? It was only $17. I clicked "Buy Now" and said a little prayer that it would arrive just like it was pictured online. It was even better than I had hoped! This dress comes in a bunch of other colors too. I think I might order a black one just to have on hand because the fit is too cute. I chose this dress because I wanted to have a very Lando inspired look without wearing an actual cape. Don't get me wrong, capes are super cool and all, but I wasn't feeling that this time around. 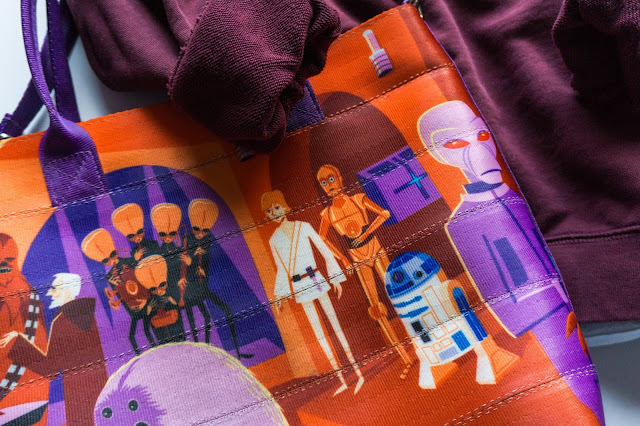 The yellow color of the dress reflected his shirt on the Solo promotional posters and the flouncy sleeves felt like little capes on my arms. Plus, it's just a really fun dress! Like I said, the dress was $17. Then I found some adorable powder blue heels at Target for $25. This is the one item I really "splurged" on even though $25 is an insane deal. I will probably repurpose them for my wedding day too! As for the accessories, the rest were all from Target as well. 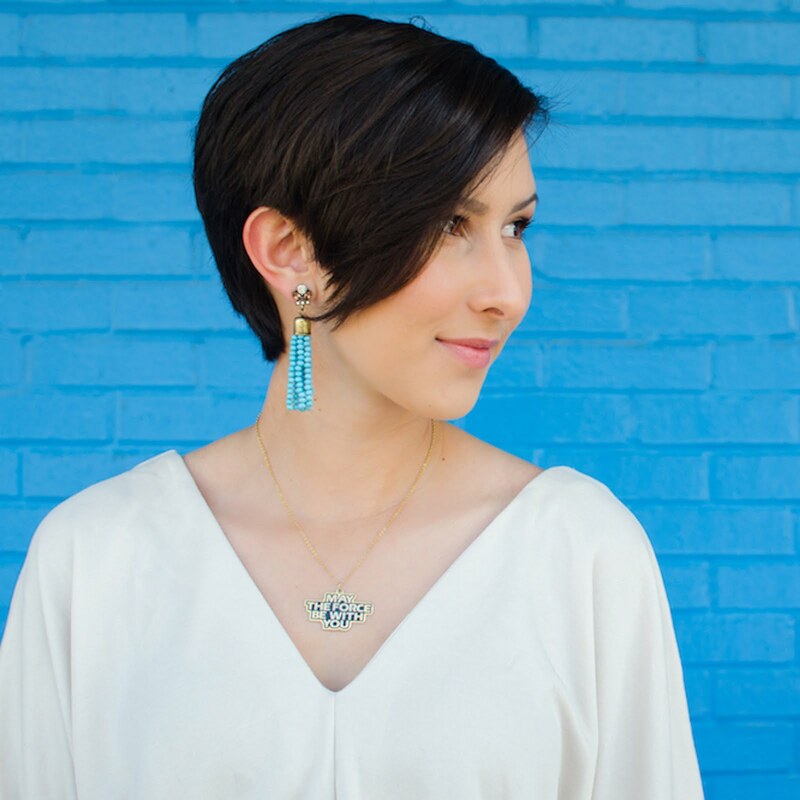 Earrings were $10, necklace was $14, and the clutch was on sale in stores for $13. Add that all up and it's a grand total of $79. Woo! I'm gonna be riding this high on cloud nine for a while! I can't wait to talk about the movie more in two weeks, but I hope you enjoyed my thoughts on the world premiere event. Your dress is adorable! All your pictures turned out great too.